One day, I was walking through my neighborhood: it was a rather hot summer day and I was out enjoying the scenery. And that is when the smell of delicious BBQ smacked me dead across the face like a hot, heavy brick launched from a automated crane. My neighbors were grilling on their front lawn, the smell was so alluring and the BBQ looked so good that I could not help ask them what they were cooking.Well, the question led to conversation, and ultimately to a free BBQ tasting. I was so impressed by the quality of the food when I tasted it, the perfection of the sear marks, and the ease of cooking that I decided my life would not be complete without a gas smoker! And the ease of cooking was also amazing. I mean, we held a whole conversation while the smoker was working its magic, and my neighbors invited me inside their house without a worry that their meat would burn on the grill. This actually removed the confusion in my mind about which smoker type I should buy. If you are looking for probably the most authentic tasting BBQ food, ease of use, and the “set it and forget it” feature, then a gas smoker is for you! I have to say, since I started using gas smokers, I have fallen in love and I will always keep a gas smoker handy! Why Should You Trust Us to Get the Best Gas Smoker? Who are Gas Smokers For? A Smoker Isn’t Just Your Average Grill! At Grills Forever, we’re always searching for grills and smokers that match every kind of lifestyle. So when we came across gas smokers, we were more than happy. For over 4 years, we have used so many gas grills for our house parties, we’ve already lost count. We found a few hits and misses, but the great thing was we were able to come up with several factors to look for in a good smoker. After researching and testing them for hours on end, we’ve concluded that the Masterbuilt 20051311 GS30D 2-Door Propane Smoker is the prime choice when it comes to the gas smokers. Smoky flavor and great taste - these are all possible with this smoker! An affordable pick you need to have in your backyard. The Masterbuilt 20051311 GS30D 2-Door Propane Smoker comes with a large cooking space of 717 square inches, but that’s not all there is to it. Our favorite pick is affordable, in fact, our Top Pick actually has the lowest price in our review list. Still, the smoker offers tons of fantastic features such as great temperature control, heat seal-in features, and hassle-free clean-up. Most of all, this gas smoker always gives smoky and flavorful results, which will keep you coming back for more. Our top pick comes in larger versions for your larger parties so that more people can experience this smoker’s stellar performance. A must-have, budget-friendly compact smoker. All of your food will taste flavorsome, smoky and tender. Pro chef approved! With damper valves that control the heat, several smoking racks, and adjustable heat control dials, this is one smoker that’s easy to adjust according to your preference. How smoky do you want it? How much flavor do you want in your food? All of that is within your grasp. 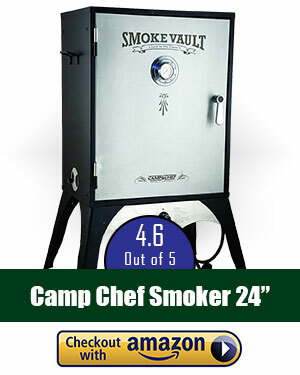 The Smoke Vault comes at a very affordable price yet it delivers top chef-level performance. Weighing in at only a 65 pounds, this little compact smoker is ideal for home and outdoor use. It could even work as a portable pick because of its light weight. This gas smoker does the smoking for you! With TRU-Infrared technology, it makes restaurant-level cooking easy even for beginners. 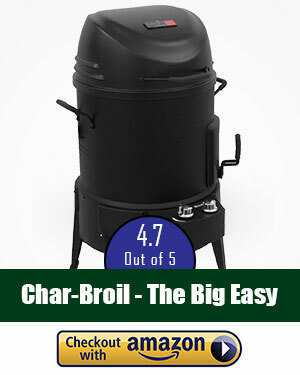 We consider the Char-Broil The Big Easy TRU-Infrared Smoker Roaster & Grill as our Beginner’s Pick because of its TRU-Infrared Technology, which really elevates the smoking experiences and takes all of the effort out of your hands. With this smoker, you can rest easy and be assured that your foods will come out tender, evenly-cooked and juicy. For its small size, it can accommodate as much as two whole turkeys, which we think is a good size for beginners. We still think even the pros would love this product because of its smart technology! Ribs, steak, turkey - this massive smoker can cook whatever you want! It’s one smoker you can rely on for heavy-duty cooking. With 7 adjustable cooking racks, this well-constructed gas smoker has the most number of cooking racks in our entire review list. It also comes with sausage hangers at the very top, so you don’t have to worry about buying them anymore. Using an auto-ignite system, the Weston gas smoker also comes with a fully-adjustable gas propane system that makes it easy to control the heat. If the smoker is too large for your liking, you have the option to buy two smaller versions but still have the same features. Worried about its price? This smoker is actually the most durable in our review list, so it’s actually a great investment if it’s going to last you years. There are a lot of BBQ review sites out there on the web. And all of them will make the claim that they are the BBQ authority and that they are experts when it comes to getting the most accurate and honest information available. What a lot of those sites will not tell you is that they get paid to write positive reviews for certain products, or that they are endorsed by certain manufacturers. 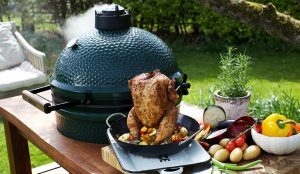 The worst thing is if you search for the best gas smoker review on Google, you will see most of the so-called smoking & BBQing experts are mixing gas smokers with gas grills. Ridiculous! If they do not know what is the difference between a smoker and a grill then the question remains that are they really BBQ experts??? And what is accurate and honest information, you may ask. I often wonder what they mean by that myself, because a lot of the information these sites post are based on other reviews by other websites that claim to do the same thing they do. But in reality, they also get their information from other questionable review sites. It’s the blind leading the blind! We personally test out each product, before we review it. At Grills Forever, we can offer you the most informative and in-depth reviews because we write from first-hand experience! There are only three of us, but we pride ourselves in cooking and eating great quality BBQ! So when we review a gas smoker, you can rest assured we put our hard earned money, time, meats, and tastebuds on the line for you! Some people find it tiresome, laboring over the grill for the whole time that they are cooking their meat, making sure to flip it every so often. And I am sure that all of us have gotten distracted in the process of grilling, forced to attend to something else, only to return to charred BBQ that is barely recognizable. You were probably wondering, isn’t there an easier way? Well, my friend, indeed there is. Gas smokers are great because they are very easy to use and offer a Set It and Forget It feature so that all you have to do is insert your wood chips (if applicable), set the desired cooking temperature and timer, throw your meats in the smoker, and let it cook! You are looking for a less involved grilling experience while still getting that authentic BBQ taste that we all love! With the best gas smoker out there, there is little maintenance that needs to be done. All you need to do is set the temperature, set your timer and insert your meats. The smoker takes care of the rest! Another benefit of having the best gas smoker is that meat does not take an extremely long time to cook. Of course, it depends on what type of meat you are cooking, but typically a grilling session with the best gas smoker will not last more than a couple of hours. The only warning I would offer when it comes to gas smokers is that, if you are thinking about participating in grilling competitions, gas smokers may not be the best purchasing option: They are too easy to grill with. Once you are convinced that you can no longer live without a gas smoker, the next step is determining which one you want and how to make the best use of it. No doubt everyone wants to get the most “bang for their buck”. When you shop around, you will find that some cheap gas smokers will include features that the best gas smoker will not and vice versa. It is ideal to know your need when you are out for shopping. The capacity of your gas smoker determines what you can cook. If you mainly grill hamburgers or filets, then grilling area may not be as important. But, if you like to do it big like me, you want to ensure your smoker is spacious with adjustable racks. You want the best gas smoker on the market that is going to offer you consistency: when it comes to using a gas smoker, you want to be able to “set it and forget it”, knowing that when the timer goes off, your meats will be thoroughly and evenly cooked every time. Like I said, there are some gas smokers out there, whether cheap or expensive, that will share some of the same features. That is why our reviews are helpful: they weed through the sales points manufacturers want to get across and offer genuine feedback on the product. You want a well-constructed smoker that will cut back on smoke and grease leakage. Make sure the cabinet captures and maintains the heat, smoke, and humidity because these three factors are the recipes for great BBQ! When you are shopping for the best gas smoker as per your needs, you want to make sure that it is easy to clean. Check for features like removable racks and a grease pan. Certain grilling racks are also non-stick and dishwasher-safe, which is convenient! Determine what type of fuel you will want to use for your gas smoker beforehand. Another consideration when it comes to the burner is its size proportionate to the cabinet of the gas smoker for even heating. You also want to make sure that the burner is not too exposed to outside forces. If you grill your meat, you won’t get that smoky flavor that you can get only with a smoker. The main benefit of smoking your meat is found in its taste. Smoking your food gives it that authentic, smoky flavor that you can infuse with flavors of cherry, hickory, and oak woods. Compared to a smoker, a grill just grills. It doesn’t come with the accessories necessary for enhancing the flavor of the food using the wood’s smoke smell. Grilling just won’t give you this much flavor! The main difference between a smoker and a grill is that a smoker comes equipped with a tray for holding wood chips. The gas is used to heat up and burn the wood chips inside the area enclosed to give the food a flavor of the wood smoke (depending on the type of wood being used). While grills are faster and easier to use, they require more “babysitting” during the cooking process. Your meats need to be turned over often, in order to give it that even sear. With smokers, you rely on heat and smoke to evenly cook the meat for you. But, if you want the best of both worlds, you could always get a gas grill smoker combo. A gas smoker grill combo has a grill on one side, and a smoker on the other. So, if you want the sear of a grill and the smoke of a smoker, then you have both the options right in front of you. The way we see it, there is only one way to pick our grills and smokers, and that way is hand-picking. Here at Grills Forever, we take pride in personally testing out every smoker that we review. Not only does it force us to eat some of the best BBQ around, but it also lets us provide you guys with genuine reviews and accurate information. Again, we do not get paid to do what we do, so our focus is on serving our readers the best way that we can! We do not just search the web and look up reviews for some of the most popular smokers on the market. At first, we try to understand the products published on Amazon. If we find it good then we contact the verified purchased persons and request them if we can test his/her smoker. You understand that it is not possible for us to purchase all those smokers from our pocket!!! This process of trial and error has turned us from grilling novices to grilling experts, and we are here to provide you with our expertise. You can rest assured that if it is a smoker worth mentioning, we have bought it, grilled with it, and tested it to the greatest extent! We bust our butts and fill our guts testing and reviewing the greatest of the great and the latest smokers on the market. This is our passion and the quality BBQ we get to eat is the only benefit we need. And because it is our passion, we go to just about any extent to get our job done right! Even when I was testing the Weber Genesis 6531001 E-330 (which belonged to one of my uncles), I was so excited to get this smoker home that I could not even wait for my friends to help me carry this 181 lbs monster from the car to the house. And in the process of unloading it, my heart dropped because the box almost fell out the car, but I was able to catch it and had not problems with smoker, thankfully! After analyzing 43 features which we believe to be the most important features to consider when choosing the best gas smoker, we’ve come up with a list of our top ten best gas smokers. To supplement your reading, we’ve made available our research report so you can easily review each product. To download the research report, all you have to do is follow us on our social media pages. So Why Is It Our No 1 Pick? After analyzing over 43 products, Masterbuilt 20051311-GS30D Two-Door Gas Smoker stood first as to build quality, usability, and price. Within 38 days, it received 10 positive reviews, the previous 10 reviews in 24 days, and the 10 even before that in 18 days. This high review rate just means that people are generally satisfied with this product and would recommend it to other fans of gas smokers. At an affordable price of under $170, it’s the most affordable gas smoker in our list. Despite its low price, it still comes with an impressive ten (10) positive features. At Grills Forever, we like looking at the “dollar per feature” ratio. Its 90-day warranty guarantees user satisfaction as well. The unit comes with a gas supply regulator and a cooking temperature control, which both make it super easy to control the temperature all throughout the smoking process. It has over a thousand reviews, which makes us confident that this product has been tried, tested and loved countless times before. This cabinet-style, vertical gas smoker comes fully assembled. Constructed with steel, this is the kind of gas smoker that will last you a long time. Many users have reported that the Masterbuilt 20051311 came with several parts that did not need any modification. Overall, user reception has been positive. The 22.75 x 30.7 x 56.02-Inch smoker weighs in at roughly 90 pounds, which is a bit on the heavier side, but in this case heavy means heavy-duty. If the 30-Inch version is too small for your liking, you can choose to buy either the 40-Inch or the 44-Inch version at a slightly higher price. The features are similar, but the 44-Inch version does come with two stainless steel burners, which is handy if you’re cooking multiple dishes at once. We would recommend buying the size that fits your major needs. 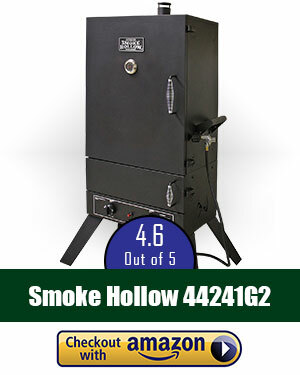 This 717-square inch gas smoker comes with four smoking racks that have been coated with chrome. Its dual doors lock in easily to seal heat and keep cooking consistent at all times, giving you a smoky and tasty flavor. Temperature is easily monitored using its built-in temperature sensor gauge, which allows its user to find the temperature inside the smoker. In addition, it comes with a porcelain-coated wood chip tray and water pan, which make clean up hassle-free. We liked that it came with an air damper which can be used to control the amount of smokiness of your foods. So, whether you’re cooking turkey, pork, ribs, trout, or salmon, you’ll always have that smoky aroma. Assembling the Masterbuilt 20051311 was straightforward and easy. It comes with a manual that contains concise English instructions as well as a separate Spanish booklet. Its parts and hardware were packaged neatly and labeled accordingly. Assembling it took less than an hour. 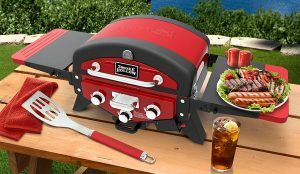 Its push-button ignition made starting the grill extremely convenient. Additionally, you can easily add smoke to this grill and it has gas controls which easily control the cooking temperature. However, we found that the 40-Inch version’s gas gauge was inaccurate at times. This smoker comes with one type 1 regulator as well as a hose. Its knob is designed to be cool to touch, ensuring your safety. You do not have to purchase accessories in order to use this product because it comes with everything you might need. At under $170, this is easily a fantastic pick. It comes with several great features as well as accessories, which make this truly worth its value. It’s actually one of the cheapest gas smokers in this review. The Masterbuilt 20051311 does not come with warranty, but this shouldn’t be a problem because users, including ourselves, have not experienced receiving damaged parts. There’s no question why this product made it to the top of our list. With so many great features that only the best gas smoker should have, this affordable gas smoker is worth every dollar. This product came extremely close to becoming our top pick. But, after spending more time for research, we came to the conclusion that, even if it has more positive features than our top pick, it’s just a little less affordable with its price being above $180. With two adjustable cooking racks, this small smoker can cook up to a whole turkey or four chickens at once. It’s the perfect choice for both home and outdoor smoking — it can cook for as much as five to six people, making it ideal for dinner parties. That’s pretty impressive considering its compact size. In fact, this gas smoker actually works as a portable smoker, too. In addition, it is powered with up to 18000 BTUs, making it the right product for slow cooking. One of the tricks to getting the best taste is temperature control. With its temperature gauge and dumper, controlling internal heat is very easy, so you’re assured that you’ll have smoky and tender flavor each time. We also looked at how real users perceived this product. We found that it has several positive reviews, as well as an impressive review frequency. If it didn’t disappoint them, then it definitely won’t disappoint you. This was the best choice for an amazing smoking experience that we noticed when we reviewed other Camp Chef smokers. This vault-style gas smoker from Camp Chef is a durable steel beast that cooks your meats to have that delicious mesquite, cherry or hickory flavor. Overall, the smoker was built using the most durable materials, which makes it a great investment. Its door has been secured tightly and spot-welded to prevent warping caused by extreme heat. In addition, it uses heat resistant black paint both inside and outside. With dimensions of 18 x 16 x 30, this large gas smoker offers a large cooking area. It weighs only 65 pounds, which is considerably lightweight, making it easily portable though it would have been more convenient if it came with attachable wheels. In addition, its racks have dimensions of 15 x 14 inches each, which is large enough to fit one whole turkey. This gas smoker comes with two smoking tacks that are easily adjustable, as well as a separate jerky smoking rack. The Smoke Vault also features three damper valves, one on top and on each side, that can be adjusted to the user’s convenience. We found that the damper really helped with the richness of smokiness of the flavor. Turning on this vertical gas smoker is easy; all you need to do is use its matchless snag-ignition system. To further control the heat, which can reach temperatures ranging from 160 degrees to 400 degrees Fahrenheit, you can use the protected drum. Cook as much pork, beef, steak and more — this gas smoker ensures that your internal temperature is maintained using its fully-adjustable heat control dials and its door thermometer, so that you get fully-cooked food every day. Assembly was a breeze — all we had to do was follow the clear instructions in the manual. It’s safe to say that this gas smoker is pretty easy to use. Cleanup is no hassle at all; the smoker features a wood chip tray, porcelain base tray, and water pan which are all easily removable so you can empty them at once. We also appreciated that the smoker came with several cooking tips and recipes which were all easy to follow. Although this smoker does not come with free accessories, users do have the option to purchase a Camp Chef patio cover and a pack of smocking chips for only a few dollars more. If you’re going to buy this product, we recommend investing in the patio cover to protect your gas smoker from rain and dirt. Additionally, users who want a bigger version may buy the Extra Large Camp Chef at a slightly higher price. At under $190, this gas smoker can be considered quite affordable. For its price, it offers great functions, convenience, and most importantly, smoky flavor. It’s rare to find cheap gas smokers that are well-built and durable these days, so this is definitely a steal. Unfortunately, this gas smoker does not come with a warranty. 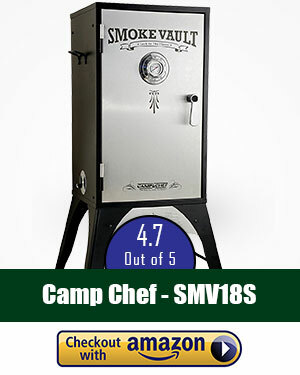 Very similar to our Top Pick, this smoker from Camp Chef is a great alternative. It offers convenient features and wonderful taste, but for the same features, we would still go with the top pick. For users who want a more compact version of our top pick, this could be a smart choice. Why is it Our Beginner’s Pick? With all of the gas smokers on the market, it can be difficult to identify which smoker does what. If you don’t like spending your time researching and figuring out how to use complicated smokers, then this pick is for you. It’s simple, affordable, and won’t have you guessing “which adjustable rack goes where” for countless hours. Although this product has only four positive features, one of those features is cooking temperature control, which we think is the most important. With it, you can already have great tasting food without having to understand other technical stuff. This is why we think it’s perfect for beginners. In addition to its portability and compact size, the Char-Broil Big Easy uses TRU-Infrared Technology and is the only product in our list to have that feature. This technology prevents overcooked and undercooked food, which is ideal for less experienced home cooks. This gas smoker isn’t just a smoker. It’s also a roaster and a grill. The Big Easy features a total stainless steel construction with premium steel grates that prevent burning of food. For added durability, it sports a porcelain-coated hood that is easy to clean. There are also safe, cool-to-touch handles. We checked online reviews from users and found that users had no problem with its build. Although this smoker features plenty of removable parts, its overall construction is impressively strong, making it worth your money. At only 58 pounds, this is a fairly lightweight smoker which makes it convenient for when you need to transport the Big Easy. It measures roughly 23 x 23 x 36 inches, making it a good sized gas smoker that doesn’t take up too much space. For its size, it can hold up to 25 pounds of meat — enough to fit two whole turkeys in its total 180 square inches of cooking space. This is the only gas smoker in our best gas smokers review that uses TRU-Infrared technology. TRU-Infrared technology assists in cooking food evenly, avoiding flare-ups, over-cooking and under-cooking. This technology also makes sure that food is always juicy. In addition, the smoker features temperature control of up to 18000 BTUs which can be easily manipulated to control the desired temperature. The smoker also features an internal meat thermometer, grease collection tray, and rotary ignition system. It won’t take you a long time to set up this smoker because the instructions are very clear, so you can get it started in no time. The Char-Broil doesn’t use any charcoal or oil, which helps with cleanliness because you don’t need to deal with an air damper and a water pan every time you want to smoke your food. Instead, it uses an internal smoker box that uses wood pellets, which are automatically loaded without the hassle of having to lose heat whenever you have to replenish the wood pellet supply. In the box, you’ll find additional accessories which include a double-stack roasting basket, instructions, and basic operating manual. Users can opt to buy its matching cover for less than twenty dollars, as well as its turkey fryer accessory kit for around $25. At under $200, this gas smoker is cheap and would fit easily in anyone’s budget. Although you might be wondering why it costs more than our top pick, that’s because this smoker features TRU-Infrared technology, which is primarily what’s adding to its price. For any beginner, this is a perfect choice. It’s a less complicated way of smoking your food, and you get foods that are never burnt, undercooked or overcooked. Its main star is its TRU-Infrared technology which even professionals will find interesting. This product costs almost twice as more as our top pick, but it does have the highest number of positive features, which is why we consider it to be one of the best gas smokers. Its features, however, are more suitable for experienced users as it has several rare features that might take some time to get acquainted with. The Weston 48-Inch Outdoor Propane Vertical Smoker is marketed as a performance-driven product, and that’s exactly what we found. Made from premium quality materials, this smoker offers a wide range of features that will make it worth your money. We say this because it has several unique features, including an adjustable damper and rotary igniter, which both make it easy to start up and control the gas pressure. In addition, it has a massive cooking space of 8.5 square feet that uses six racks, a rare find among gas smokers. It also features two sausage hanger racks, which gives you room for all kinds of cooking. One of the key tricks to getting a good smoke is maintaining the right cooking temperature. With its built-in temperature gauge, we were able to accurately see the internal temperature, and we knew when to make adjustments. It also has three adjustable dumpers which help control the internal temperature and give you tender and smoky meats. The dumpers also ensure that your food is never undercooked or overcooked. This black-coated steel cooking cabinet is fully-welded to ensure its maximum durability. Although this is a single unit cabinet-style gas smoker, it comes with two, cool-to-touch handles to give support and balance it out when opening the door. Weighing in at 110 pounds, this 17.5 x 17.5 x 49.5 inch gas smoker is quite heavy, which puts it under the commercial category. With that said, it would be hard to transport this gas smoker since it does not come with wheels or detachable legs. This gas smoker has the most number of cooking racks out of all the products in this best gas smokers review. All of the racks are removable and adjustable. In addition, it comes with two sausage hangers at the very top. The Weston gas smoker comes with a rotary igniter that gives an easy start-up, as well as a fully-adjustable propane system to help you control the heat. Its non-electric burner runs at 9000 BTU per hour, which isn’t as high as the other products in this list. To conveniently monitor the temperature, users can make use of the temperature gauge which accurately shows the internal temperature of the gas smoker. Setting up this gas smoker from Weston was fairly simple. The box included easy to follow instructions, and we had the gas smoker up and running in around one hour. For cleanup, it features a removable, porcelain-coated water pan and a smoking box, which both make it convenient to empty them out after cooking. 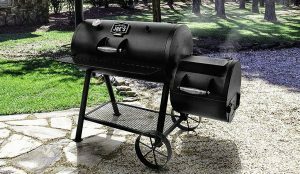 The great thing about this product is that it comes in several smaller sizes, so if the 48-Inch vertical smoker is too large for you, you can always buy the 30-Inch or the 36-Inch versions. The Weston 48-Inch Outdoor Propane Vertical Smoker does come with two sausage hangers and plenty of space inside its cabinet, but you can purchase the smoker rack and the turkey rack for just under $15 each. On the pricier side of our review list, the Weston gas smoker is priced in the $380 range, which might be too expensive for some users. However, for the heavy-duty capacity and commercial performance that you get, it’s actually a decent price when you think about it. 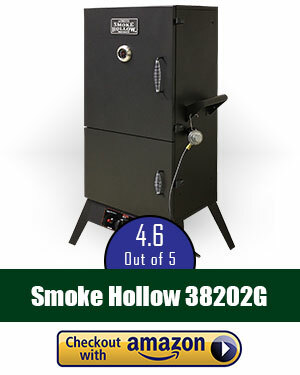 This is actually one of the most durable gas smokers in our review list, so its value exceeds its price. It comes with a warranty that’s valid for one year. It might be expensive, but it does cook a hefty lot of food at once. 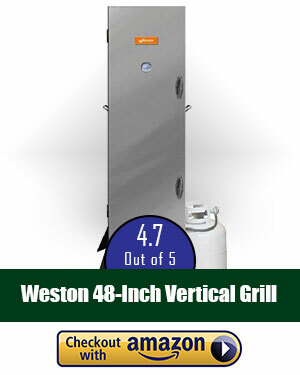 Durable, easy to use and heavy-duty, the Weston Outdoor Propane Vertical Smoker is a bang for your buck, especially if you’re using it for commercial purposes. We have ranked these according to their performance. Lightweight and compact, this gas smoker can already smoke you an entire meal. Best for homes and small barbecue parties. This cabinet-style propane gas smoker was constructed with quality in mind – something this brand always take care of in all of their products. With a black steel body, this huge smoke box is well-made, heavy-duty, and reliable. It comes with two handles that are safe to touch even when the smoker is being used, as well as handles on each side for easy mobility. Fuel runs at 20000 BTUs. At a light 68 pounds, the Smoke Hollow 38202G 38-Inch 2-Door Propane Gas Smoker is easy to lift and move around. This makes it a good choice for outdoor barbecuing at different places like campgrounds or at the beach. The Smoke Hollow Propane Gas Smoker features a large 3.4 cubic feet of cooking space, large enough to fit several vegetables, salmon and some steak. It comes with four chrome-plated cooking racks which can be removed and adjusted to fit bigger meats like turkeys and whole chickens. To make the most out of the smoke, it features two vents that control the temperature, allowing for the right amount of smokiness. You can access the wood chip tray and water pan using a separate door, so that you don’t have to lose precious heat whenever you’re refilling. Instructions are simple and clear, and you can set it up easily in less than an hour. The smoker itself heats up very fast using a push-button ignition system. For easy viewing, it features an external temperature gauge that accurately shows the internal temperature. This smoker comes with an LP type 1 gas hose and regulator. You have the option to buy the version with a cover to protect it from the elements. Among the products in our best gas smokers review list, this is priced within the medium range. In fact, this product was actually labeled as Amazon’s Choice online, which gives us assurance that customers perceive this product well. It’s a reasonable price for a sturdy compact smoker. Compact, well-constructed and convenient, this gas smoker from Smoke Hollow is a good fit for anyone who wants a reliable propane gas smoker. But, for its price, we would still prefer the previous picks because they feature more functions at a cheaper price. This big, boxy beast is perfect for parties in your backyard. With multiple cooking racks, you can have food flowing all day long. 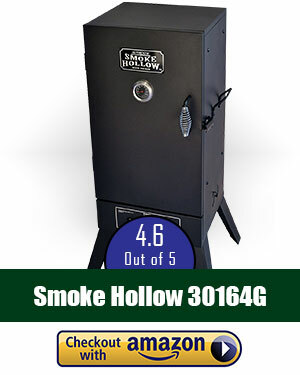 The Smoker Hollow 44-Inch Vertical Propane Gas Smoker flaunts a heavy-duty steel construction. With dual doors, it gives access to both the main cooking area and the wood chip panel and water pan stations. Its burners are made of stainless steel for optimum performance. This propane gas smoker weighs a solid 100 pounds, and measures 33 x 24.5 x 60 inches. This is a fairly large smoker, which makes it ideal for big parties. With five cooking grids that are adjustable and removable, the smoker gives you plenty of space to cook your fish, meats, and vegetables. This 6.5 cubic-feet gas smoker features two basic cooking grids, two jerky grids, one rib rack, and one sausage hanger. To control the temperature, it uses dual burners and gives your food that rich smoky flavor through its two wood chip pans. The external temperature gauge accurately displays internal temperature. A large glass window offers users plenty of viewing space so that they can check on the progress of their cooking whenever they want. We checked online reviews and found that some users were given faulty items which needed immediate replacement. But other than that, assembly was easy to follow. This smoker uses a push-button ignition system so that you can get started instantly. Cleanup is also a pinch — the water pan and wood chip tray are accessed through a different door, and can be removed and emptied conveniently. This product is a bit pricey at around $250 but it offers similar features as other products in this review. We think that its price draws heavily from its solid construction, reputable name, and multiple cooking racks. It does not come with a warranty, but customer service will gladly replace any products which have malfunctioned or arrived damaged during shipping, as reported by customers. For a little more than $250, you do get plenty of cooking space and durability, but for its price, we would still go for the other items in this best gas smokers review. If you have money to spare and want a solid smoker from a reputable brand, then you can choose to buy this smoker. This takes temperature and smoke control to a new level. Great choice for flavor and convenience. Best for pros and beginners. This vertical gas smoker is made of heavy-duty steel for optimal durability. It flaunts a powder-coat finish which increases its lifespan. Its shape allows heat to naturally rise for improved smoke flavor and efficiency. It was designed to enable air to flow and be distributed all throughout the smoker. With a total cooking space of 784 inches, this large LP gas smoker weighs – surprisingly – only 54 pounds, which is quite lightweight for its capacity. It measures 19.2 x 27 x 46.5 inches, making it a tall smoker that does not take up too much space. This smoker actually comes in other sizes, large and extra large, if the standard size is too small for your liking. 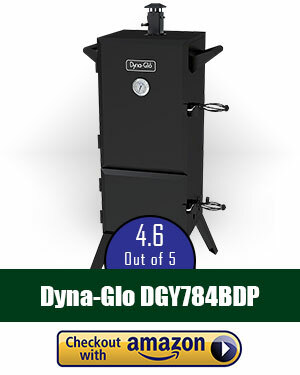 The Dyna-Glo DGY784DBP Vertical Liquid Propane Gas Smoker features an impressive grease management system as well as a smart heat maintenance system. It uses a 15000 BTU cast iron burner and push-button ignition to easily fire up the unit. Its ‘Smoke Zone’ feature identifies the ideal temperature for smoking. For better cooking control, it offers two doors which locks heat in and makes refilling of wood chips more convenient. Its wood chip box is porcelain-enameled, making it burn heat most efficiently, perfect as low-maintenance cooking. In addition, its water bowl can carry a large volume of water, so you don’t have to refill it again and again. Assembly would take less than an hour, however, several customers have complained that they received minimally damaged items during transit. However, customer service is generally responsive and accommodating, so there shouldn’t be a problem if you need assistance. During cooking, you can expect consistent temperatures and convenient monitoring. It’s not entirely a “Set it and Forget it” kind of smoker, but it does offer great convenience and ease. The Dyna-Glo comes with a hose and a regulator, but it does not come with a propane tank. Users can buy the version that comes with a gas smoker cover to protect it from the elements. The cover is custom-fit to ensure that it stays on and protects your smoker for years. It’s a bit on the expensive side of our product review list, but when you buy this Dyna-Glo gas smoker, you’re buying several things: customer service, quality, convenience and ease, and tasty flavor. It’s definitely something worth buying if you want fantastic-tasting food without the hassle of standard smokers. Its warranty is CSA-verified and is valid for one year. If it weren’t for the price tag and customer reviews, we would have chosen this as a top pick. It offers great convenience and ease when cooking, and maximizes its features in order to give the best tasting, smoky flavors. Need a gas smoker than you can use on a daily basis? This is the one! The cheapest product in our list is best for families! This one piece, cabinet-style propane gas smoker is constructed using high-quality steel for maximum protection. It features a spring wire door handle which is cool to touch, making it safe to use even without gloves. Its legs are eighteen feet deep, and are not removable for extra stability. The Smoke Hollow 30-Inch Propane Gas Smoker measures 39.5 inches tall and 21 inches wide, which makes it a relatively small gas smoker. It features side handles which make it easy to carry when transporting the gas smoker, but it does not come with wheels. This auto-ignite gas smoker uses a 10000 BTUs stainless steel burner for optimum temperature control. Temperature is controlled by using the knob on the gas smoker, similar to what you would do when grilling using a gas grill. It also features 3 chrome-coated smoking grids which can be easily adjusted and removed for varied grid levels. To monitor the temperature, it uses a built-in thermometer, which then displays the temperature on the external temperature gauge. Assembly is easy to follow, but customers have said that they have received broken parts. But, management was quick to respond and replace the broken items. It also features a water pan that sits above the wood chip pan. We would have preferred if it had a separate door for both the pans, in order to retain the heat. This is the cheapest gas smoker in our review list, priced under $170. A good ol’ dependable gas smoker, the Smoke Hollow 30-Inch Propane Gas Smoker is easy to use and good for families. But it just offers only the basic features. Our Top Pick costs the same yet offers much more. For your fun, instant outdoor parties, look no further. No hassle trying to figure this thing out. Use it straight out of the box! The Smoke Hollow 38-Inch Propane Gas Smoker sports a painted steel body. It has one handle on each side, in case you want to move the smoker around. It also has 18.5 inch deep legs which cannot be removed. This is a two-piece cabinet-style gas smoker that has spring handles which are safe to touch. At 70 pounds and measuring 25 x 47 x 17 inches, this is a fairly small smoker that weighs a lot. Compared to our other picks which were bigger but weighed lighter, this one is more compact yet solid. The Smoke Hollow is perfect for larger groups of around six to eight people. This 3.4 cubic feet capacity smoker features 4 chrome-plated cooking grids that have multiple adjustments levels, and can be removed at your convenience. Get multiple cooking heights and be able to cook whatever you want, whether that’s fish, ribs, or poultry. Additionally, it has a porcelain coated water pan and wood chip tray, which are both accessible through a separate door, which helps lock in the heat when smoking. It was easy to set up because the user manual was illustrated and easy to follow. Each of the parts was labeled accordingly, however, we found a few issues with the thermometer. It was defective and inaccurate, but the manufacturer was kind enough to replace it immediately. With a price tag a little higher than $190, this is a reasonable price for this kind of product with its array of features. There are some smokers that offer single-unit, one-door chambers at a higher price. This has two chambers, which we found more convenient, at a price lower than most of the smokers in this review. Reliable and efficient, this 3.4 cubic inch gas smoker can be used for all of your large parties. Have fun cooking as much as you want for hours on end. It’s easy to use, so even your beginner guests can have a go at it. Durable, compact and efficient, this gas smoker is any beginner’s dream. It costs quite a bit, but it’s worth the investment. The Camp Chef Smoker was designed to lock in the flavor of hickory, cherry and so much more in your gas smoker. It’s made of heavy-duty steel for protection. This simple smoker can reach temperatures of up to 350 degrees Fahrenheit. This gas smoker weighs 75 pounds, which is a bit heavy for its small size. It stands a total of 44 inches tall, with cooking racks of 21.5 x 14 inches. 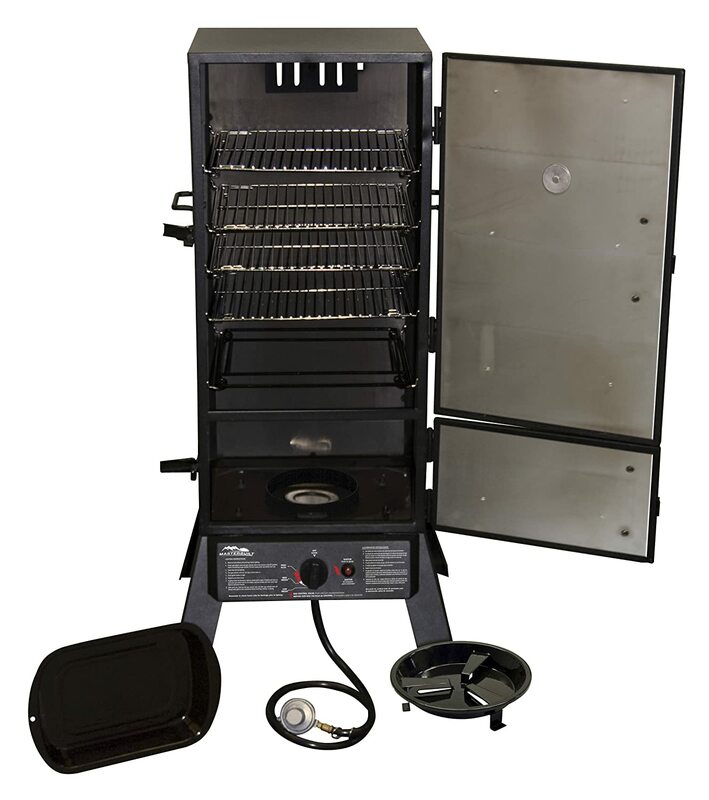 A small, dependable smoker, the Camp Chef Smoker comes with two adjustable smoking racks, a jerky rack, and three damper valves on each side that can easily be cleaned up. To monitor your cooking, you can easily check the external temperature gauge on its door. In addition, this smoker features a protected burner drum which gives maximum temperature control. Cleanup is easy; the smoker has a water pan and steel wood chip tray which are easy to empty after use. The smoker starts with a click of a button. Its matchless snap-ignition system makes it easy to start the smoking process. In addition, the smoker comes with lots of cooking tips and recipes, which users can quickly follow through illustrated manuals. As mentioned, it comes with cooking tips, recipes, and tricks that make cooking a more fun experience. It comes with a gas line, but you’ll have to buy the propane tank yourself. We found this gas smoker to be a bit expensive for its features. It is an overall basic beginner gas smoker, but costs more than $240, which is quite expensive as compared to other items on our list. This product is quite expensive, but if you’re a beginner looking for something very dependable and easy to use, you might want to splurge on this gas smoker. When we were researching gas smokers, we noticed that traditional gas smokers often lacked some important features that could bring more convenience to the overall grilling experience, such as automatic temperature control, the auto-shutoff feature (so that gas doesn’t leak when the flame is extinguished), tank fuel level indicator, and more. We did some more digging and found this smoker that could be of great help in this regard: Masterbuilt 20051316 Thermotemp X-Large Propane Smoker. With so many new additions to the industry and with people’s changing tastes, we had to carefully reconsider whether we’d still keep it in our list or not. Finally, we chose to place it in this honorable mention section. With this gas smoker, Masterbuilt implemented its patented thermostat controlled temperature control system to make sure your smoker maintains a consistent temperature throughout the whole cooking session. But how does it work? Well, this smoker features a thermostat with temperature sensors that throttle and control the intensity of the burner to maintain your set internal temperature. Masterbuilt 20051316 has also exceeded all expectations with its safety valve system. If your smoker is about to get very hot, this safety valve will extinguish the burner to avoid any risks or dangers. So, if you’re forgetful, this Masterbuilt smoker has got your back. Another very useful feature that this gas smoker has is its fuel level gauge, which is a display on the smoker cabinet that indicates how much propane is left in your tank. So, no more shaking the canister around, trying to see if there is anything left inside. Just look at the gauge. Temperature consistency was obviously a huge consideration of the designers who made this grill, which is undoubtedly a great thing because it makes sure that your meat is cooked thoroughly and evenly. 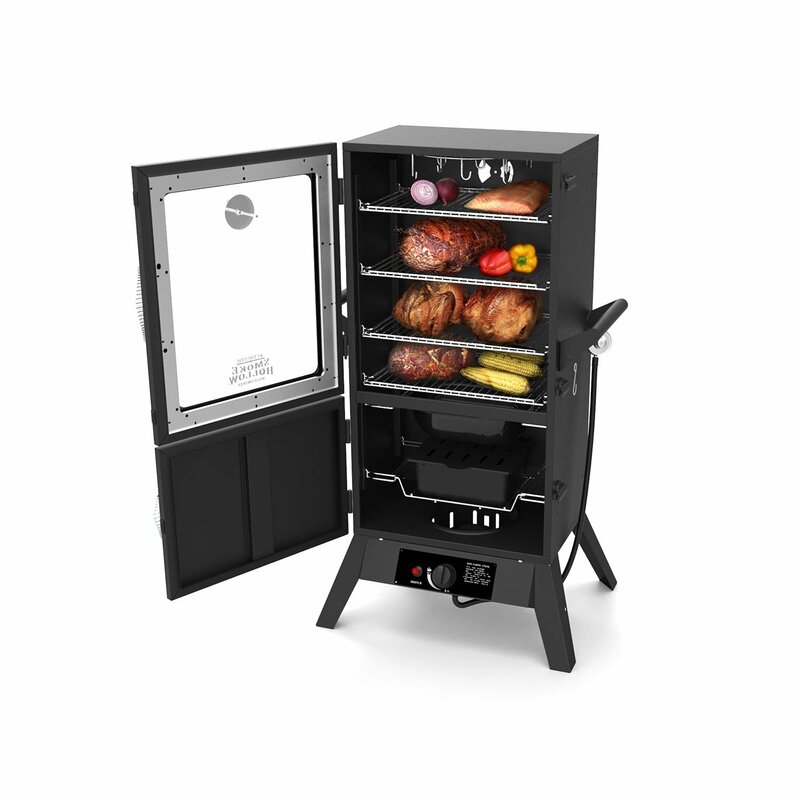 The dual-door design allows you to add in your preferred wood chips to the burner while smoking, without losing any heat or smoke in the process. This grill also offers a large grilling space. With four smoking racks and 965 sq. inches of space, it’s going to be hard for you to run out of the room. No matter the occasion or the size of the meat you are cooking, Masterbuilt 20051316 Thermotemp X-Large Propane Smoker will undoubtedly be able to handle whatever you throw at it. Be warned: this smoker is not for the faint of heart or the shallow of pocket. But Weber is well-known for manufacturing some of the highest-quality gas smokers on the market, and this model lives up to that expectation! The Weber Genesis E-330 features 2 side tables for extra work space, offering you the convenience of preparing your meat while still grilling. With a total cooking space of 5077 sq. inches and a warming rack measuring 130 sq. inches, you aren’t going short of space anytime soon. With the Weber Genesis E-330, you can grill with propane or natural gas. Also, you no longer have to put up with that ugly gas canister hanging off the grill like a baby with an umbilical cord: you can store the canister right under the grill in the storage cabinet. This gas smoker has three stainless-steel burners, each with its own electronic ignition system. The built-in thermometer, internal temperature display on the smoker lid, and the porcelain-enameled cooking grates made with cast-iron help retain and evenly distribute heat along the surface area, while making those beautiful sear marks on your food. Weber comes with a feature called the Flavorizer Bars. These bars are designed to help you catch the grease dripping from the meat and vaporize them to increase the flavor being infused with the food. All the unvaporized grease is redirected away from the burners and to the grease management system. This extends the life of the burner tubes and prevents flare-ups. You do not have to be a well-seasoned griller to look like a professional with this grill. It offers a truly stellar design and every component is well constructed. 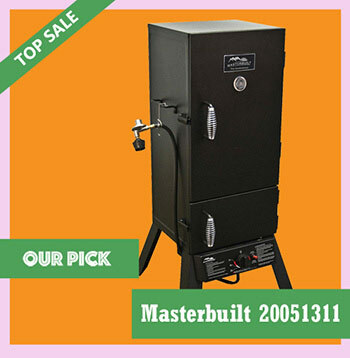 As stated before, this smoker’s price is on the expensive side but you will get what you have paid for – great quality. Also, the assembly can be daunting for the beginners, but once you get this smoker fired up, you will have no regrets. Despite all that, the insane price tag made us place this in this section. When you first get this smoker, you’ll notice it has a sleek stainless steel design that is very functional. It offers a storage cabinet where you can keep your propane tank out of sight. There is also extra space in the storage cabinet for other items you may want to store. This smoker has a side burner and extra workspace which is useful when cooking big meals and preparing sauces or cooked vegetables on the side. Another great feature of the Char-Broil Classic Gas Grill is that it has 4 burners with a total output of 38,000 BTU. In addition, the flush-mounted side burner generates 10,000 BTU of heat. So when it comes to how you want to grill your meat, you have a lot of versatility to choose from this grill. Each burner can be controlled separately by the temperature knobs. The burners on this grill are also backed by a 5-year warranty from the manufacturer. The main grilling area measures at a total of 480 sq. inches, while the side burner offers a 180 sq. inch grill area to work with. Again, this is very useful because it allows you to smoke all the meat you need to cook in one go. The porcelain-coated grates make it so that your meat does not stick to the cooking surface, making cleanup after cooking that much easier. The porcelain coating also helps in even distribution of heat. With extended use, we have found that this grill slowly begins to deteriorate. For example, after a couple months of regular use, the electric ignition ceased working and we had to start lighting the grill with a match. Also, the sleek design that may impress you at first is prone to tarnish and could blacken. So, cherish the exterior while you can! Finally, the dangling grease trap does not always drain properly and can make cleanup tedious. So, we decided to give it a spot here for its pros and not in our top 10 list for its cons. 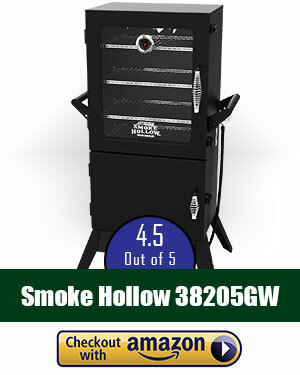 When it comes to the Smoke Hollow Pro Series Lp Gas Smoker, we really do not have much negative to say, except for the price of this smoker. While it offers great grilling space, ample grilling grids and a great design, you can get a comparable gas smoker for a cheaper price. The only con of this smoker we noticed was that sometimes its drip pan did not retain all of the grease, and with the temperature knobs below the smoke cabinet, they could become subject to corrosion. But leakage is generally not so common and the quality of your BBQ is going to be great. There are many reasons to get a vertical smoker and the features of Char-Broil Vertical Gas Smoker make it more obvious. Char-Broil has really gone the extra mile to make sure that this smoker is a convenient product for its users: with its cool-touch handles, warming rack, diverse grilling racks, and snap-ignition, there is no wonder why so many grillers recommend this smoker. Some of the drawbacks of this smoker, including inaccurate temperature gauge and difficult assembly made us hesitant to rate it higher. One of the major benefits of buying a gas smoker is that it is relatively cheap, while still offering good quality BBQ: you still get an enchanting aroma that will tantalize the neighborhood and the large smoke cloud that lets the heavens know, your BBQ is on fire! Your meat will come out juicy and tender with that authentic BBQ flavor. But, being that these smokers are relatively cheap, there are certain steps you should take to extend the life of your gas smoker and ensure optimum performance. Buying a dedicated rack for messy and sticky meats like ribs can greatly extend the life of your stock grilling racks. You will feel more comfortable scraping a cheap rib rack clean as opposed to a chrome-plated or porcelain-coated stock grill rack. Whether you live in a hot and humid climate or a cold, rainy area, your smoker may begin to tarnish and blacken if exposed to the elements long enough. A grill cover will help prevent this from happening. While most smokers advertise that they are able to handle extremely high temperatures, these high temperatures can eventually damage the insulation of your smoker cabinet. Slow cooking of meat can make them more tender and flavorful, so cooking your meats at a lower temperature can be a win-win. Thermometers on gas smokers are not always the most accurate. Upgrading your thermometer is a small investment that will make sure your meats are cooked at the desired temperature, offering you greater control over and satisfaction with your cooking experience. Many water pans that come with gas smokers do no accommodate long cooking times and the water will evaporate long before you are done smoking your meats. Hand in hand with cooking at lower temperature, a higher capacity water supply can also make sure that your meats turn out juicier. Consider water supply – most of the gas smokers in the market come with limited water pans, which can easily evaporate. It’s important to check the size of the water pan in relation to the amount of food you will be cooking. Having a larger water pan will allow you to step back because you won’t have to constantly refill throughout the cooking process. Buy a cover – Gas smokers usually do not come with covers. While the construction of your gas smoker may be excellent, it still wouldn’t hurt to buy a cheap cover to protect it from the elements and prevent rust. Natural gas smoker – If you’re the kind of user who wants to use natural gas (NG) instead of propane as your smokers gas, check with the manufacturer first if this can be done. Very rarely do gas smokers have connections to a natural gas line. Most of the time, they are only connected to propane tanks. However, Camp Chef gas smokers sometimes have conversion kits which you can use to convert your gas smoker into a natural gas smoker. Overall, gas smokers are a great addition to your outdoor cooking equipment. They are easy to use, offer that savory, authentic flavor, affordable, and are better than charcoal grills. They produce clean heat, which is why they’re quite popular in restaurants. In addition, they require as little maintenance as an electric smoker, and have that similar “set it and forget it” feature. When looking for the best gas smoker for you, you should consider several things like ease of use, temperature control, build quality, cooking space, accessories, and value per dollar. 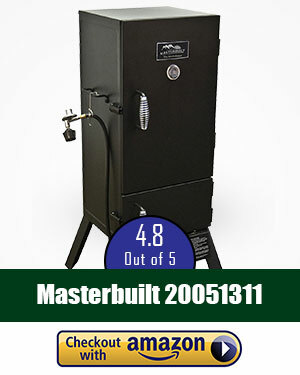 After testing and reviewing the best gas smokers in the market today, including those from famous brands like Pit Boss, Masterbuilt, Char-Broil, Camp Chef, and so on, our Grills Forever team concluded that the MasterBuilt 20051311 GS30D 2- Door Propane Smoker is the best of the best. It’s our favorite because it always delivers flavorful food, has so many useful features, and comes at a surprisingly affordable price. Its larger, 44-Inch version is equally good if you want a bigger cooking space for your grander parties. It’s definitely something you can keep in your backyard for ages! TRU-Infrared technology is used by Char-Broil gas smokers. It’s a patented technology that ensures success in all types of cooking. TRU-Infrared begins with steel emitter plates that retain the natural infrared heat coming from flames. It then radiates the heat toward the food, giving that evenly-cooked finish. TRU-Infrared technology prevents undercooking, overcooking and flare-ups. It also eliminates the chances of having cold and hot spots on your food which are commonly caused by an uneven grilling surface and temperature. A rotary ignition quickly starts up your unit. It is similar to the knob that you can see when using gas grills. Basically, almost all gas smokers feature rotary ignition systems which light up the unit quickly. Adjustable dampers assist in controlling the smoke and the heat inside of the gas smoker. This is necessary in order to attain the best kind of meat. The quality of the meat depends on the right adjustment of these dampers. It takes skill and practice to adjust the dampers properly, giving that smoky and rich flavor that all smoked meats should have.